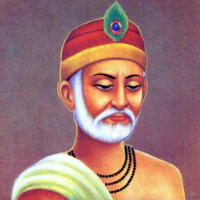 "Kabir was a 15th-century Indian mystic poet and saint, whose writings influenced Hinduism's Bhakti movement and his verses are found in Sikhism's scripture Guru Granth Sahib. His early life was in a Muslim family, but he was strongly influenced by his teacher, the Hindu bhakti leader Ramananda. Kabir is known for being critical of both Hinduism and Islam, stating that the former was misguided by the Vedas and the latter by the Quran, and questioning their meaningless rites of initiation such as the sacred thread and circumcision respectively."